New love, old enemies, and a hero's daughter. It's been a long time since Balto and Aleu's adventure, Kodi and Dusty are already mates and couldn't be happier, Dingo has a nice life as a housedog, but when Saba sees how happy kodi and dusty are, she realizes she's missing something, something Kodi and Dusty have, she needs someone to love, and even though she is the most popular dog between the female dogs, and the most wanted between the male dogs, she is still unable to find true love, but deep in the forest there's a lone wolf, Nobu, who accidentaly ends up finding Nome, Sabba and Nobu meet in the beach and fall for each other, but Saba's love story seems to be in danger when Balto forbids Saba from dating Nobu, he prefers her daughter to date a local dog instead of an outsider wolf, Saba refuses to stop seeing Nobu, and Kodi and Dusty support her on her desicion, but Dingo is on his father's side and hate Nobu, but for a short time, things don't seem to be nothing but a small family discussion, but when Steele and Niju meet and join forces to get revenge from Balto trying to kill his family, and with an unexpected visit from Aleu and her pack, tension grows and Balto gets completely tired of Nobu and his romance with Saba. Will the new couple have the happy ending they want so much? How is Balto going to deal with Aleu's visit, Nobu´s feelings for Saba, and stop Niju and Steele from hurting his family at the same time? Re: New love, old enemies, and a hero's daughter. Ill be Balto and kodi again if thats alright? Extras: A lone wolf for almost all of his life, mistreated by other wolves and chased by many hunters, Nobu found happiness for the first time when he meets Sabba. Can I be Saba and Dingo? Extras:She is a great leader and she look like a wolf. Can we start this one? I will play Steele, now we just need Niju. Extras: after he left Nome, he lived alone deep in the mountains before finding Niju and making a new alliance, now he wants revenge from the wolf-dog that stole Jenna's heart, he won't stop until he finishes Balto off. The sun was high on the sky as Nobu walked out of the forest and saw a little town nearby.-"Hmm...that's a weird kind of den...maybe I can find a new pack there..." He then looked at the beach, it was a hot day and he had been walking for a very long time and was exhausted.-" But maybe I should rest a little bit on that beach, it's been a long day and I don't even know if there are friendly or evil wolves..."
He sighed and walked to beach and lay down looking at the sea.-"This is so relaxing...what a nice place to live, I hope I can stay here, I'm tired of running from wolves and hunters...This is not the life mom wanted for me..."
Balto was near by on his ship He noticed the wolf and was not sure who he was. He walked off the boat to where the wolf Lay. 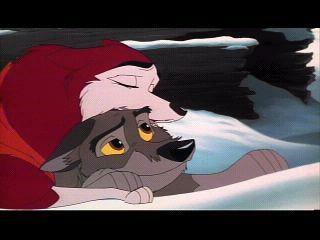 Hello he said accidently startaling the sleeping wolf Sorry to scare you but I am Balto And wanted to know who you were? Kodi meanwhile was just waking up with his team to do a mail run. He was ready andwas playing with his best friend kirby. Are you guys ready to run he asked Excitedly? Nobu stared at Balto, he sniffed and realized his essence was pretty much like a wolf, but he didn't look like one. "I-I'm Nobu...y-your essence...is from a wolf...but you don't look like one...how come?" - Asked Nobu,still uncertain if he could trust Balto. Oh well see Im half wolf and Half Husky. My mother wasa beautiful white wolf by the name of Aniu and my father was a husky who I never knew. nice to meet you Nobu balto sniffed his fur. You are younger then me im sure what brings you to nome? Kodi chased his borhter with Kirby on his tail im going to get you Dingo You just wait he said Laughing. Im glad Balto said I miss you sometimes He said. So Nobu I would like you to meet my Daughter Saba.